Vital Sleep is one of many products that claims to help the user reduce or stop their snoring altogether. If you have used a mouthpiece for sleep apnea or to prevent snoring then you probably know that they are expensive and not the most comfortable thing to sleep with. What makes this product different is its ability to adjust specifically for each individual user. Other mouthpieces use a one-size-fits-all design. 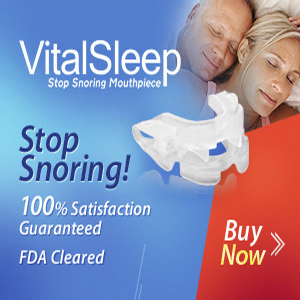 With its adjustment options, Vital Sleep is the best “Stop Snoring Mouthpiece” on the market today. Snoring is caused by restrictions to the air pathway. This restriction is the result of the vibration that occurs when the soft tissues of your throat and nasal passages are too close together. As air is forced through these restricted pathways the vibration causes snoring. The worse it is the louder the snoring. This is a mouthpiece that is custom molded to fit your dental frame. By bringing the lower jaw slightly forward with the Vital Fit your air passage is opened up more to allow you to breath more freely. This eliminates snoring and allows the user to get a restful night’s sleep and feel more refreshed the next day. After the initial molding you will be able to adjust the lower half so that it fits specifically to you. The lower jaw piece can be adjusted in small increments up to 7 millimeters, and this is done by turning the hex screws on both sides with a special key (which looks like an allen wrench) that you will receive with your order. The material used is BPA and Latex free. It is also cleared by the U.S. Food and Drug Administration. The VitalSleep snoring mouthpiece can be custom fit using the usual boil-and-bite-down technique. It can be further customized with a special key that can move the lower half of the mouthpiece to fit the individual user more comfortably. The Vital Sleep is non-irritating, and the flexibility allows for side-to-side movement to eliminate strain on your jaw while you sleep. Air holes in the mouthpiece allow for easy breathing through your mouth. Backed by a 30 day money back guarantee as well as a 1 year replacement warranty. Package ships the same day you order so you receive it quickly. Comes with a travel case to ensure that you can keep it protected when you take it on the road. Comes in two sizes for men and women. In order to take advantage of the 1 year free replacement warranty you must purchase directly from the Vital Sleep website. Get one for $59.95 or two for $99.95. You also have 30 days to return it for a full refund (minus shipping and handling) if you are not completely satisfied. I think that the product is a must-have for anyone that either snores or has to sleep next to someone that does. After a single night of use my wife told me that I can’t go to sleep without it! Not only did I feel great the next day but so did she. There are a couple of things that I do need to warn potential buyers about. For one, you cannot use the mouthpiece if you wear braces. The literature that accompanies the mouthpiece also warns that if you have certain dental work done, such as caps or a bridge, that they could come loose. This isn’t explicitly stated so I wanted to make sure that I mentioned it. One negative thing that I did read in other VitalSleep reviews that I agree with is that it’s not the greatest thing to clean. They recommend that you clean it on a daily basis with a toothbrush and toothpaste, and once a week soak it in a glass with a denture tablet. It’s not the worst thing but it is one more thing that you have to do. This minor complaint aside, I have great affection for my mouthpiece. If you are a snorer then you need to try this for yourself. You have nothing to lose but a good night’s sleep.